Pulahan, literally “those wearing red”, refers to the members of a religious movement and warrior cult that developed in the Philippines following the Philippine-American War, around 1902-1907. At its peak, it numbered around 10,000-15,000 adherents. The movement began after the Philippine Constabulary took over patrols in Samar, after the U.S. military declared it pacified. The weapon of choice was a heavy, crescent-shaped Bolo knife. Their battle preparations consisted of bottles of holy oil, prayer books, consecrated “Anting-Antings” (magical charms), and other religious paraphernalia. Led by priest-warlords; one of these priest is known to be our GGM’s teacher General Faustino Ablen, Pulahan were notorious fighters, usually disregarding better technology (such as firearms), in favor of hand-to-hand fighting using their bolos. The Pulahan sought nothing but death in battle, making them very dangerous combatants and also contributing to their high casualty figures. In seeking death in battle, they believed that those who perished would be sent to paradise. The Pulahan main battle tactic was simply to advance upon the enemy, fire a volley, then throw down their firearms and rush in to the enemy and fight in hand-to-hand combat. To the Americans, he was known as a rebel. To the Pulahan, he was known as a leader and Holy man. To the Great Grandmaster, he was known as teacher. Through cultural perspectives, Faustino Ablen was many things to many people. In history, he is known as the rebel leader of the Pulahan of Leyte. A spiritual rebel movement in arms against the occupying forces of the Americans in the late 1800’s – early 1900’s. Known to his people as “Papa” Faustino Ablen, he was part of a spiritual sect of holy men, proclaimed healers and deliverers of their people, preaching throughout the land of Filipino unity and the evil of the occupying forces. “Anting-Antings” were magical, spiritual amulets, medallions, and writings that Papa Ablen provided his people before battle and for healing. He was not only known as a healer but also as a fierce warrior. His army of Pulahan warriors was armed with only their razor sharp bolos, their “Anting-Antings”, and their warrior spirit. The fiercest of warriors of the time matched only by the Moro’s of Mindanao, the Pulahan brought fear to the soldiers with the battle cries of “Tad Tad” as they rushed the regiment lines fearless of the guns knowing of only one thing, drawing blood. The Pulahan Wars (1902 – 1907) saw much bloodshed on both sides and made Papa Faustino Ablen a wanted man. 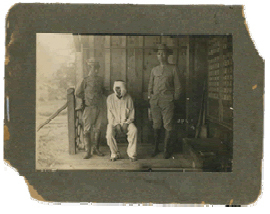 In history there are many accounts as to what happened to Gen. Ablen, some say he was killed and others say he was captured and never heard of again. Great Grandmaster Braulio Pedoy (1981). From what Great Grandmaster Pedoy has told us through his oral history is that he escaped and found his way to the mountains to live out his life. It wasn’t until a young boy from Ormoc City ran away from home and came across a small hut and campfire. This boy was Great Grandmaster Braulio Pedoy and the man he found was Faustino Ablen. To GGM Pedoy, Faustino was a General of a rebel army who refused to salute and bow down to the American flag. Ablen had told GGM Pedoy that he was in hiding and no one has been able to find him until now and that it must be fate that they had met. 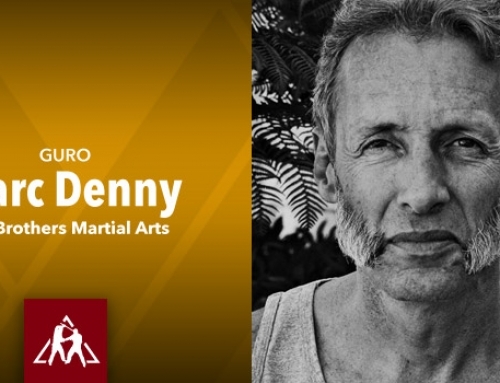 Faustino Alben took in GGM Pedoy and taught him his art of Derobio; a battle tested no-nonsense bladed art form of Eskrima. For eleven years, the GGM trained and lived with Faustino Ablen in the mountains of Leyte; as apprentice and master, as it was done centuries before them. Through a grueling test of his acquired skill and knowledge of Derobio; the young Braulio Pedoy was made Master, Ablen sent GGM Pedoy out into the world to learn and spread the art of Derobio to assure its legacy. GGM was told to seek out other Eskrimadors and open his heart and knowledge to all forms. Through his travels he met many compadres, had many battles that tested not only his skill but his spirit as well. Great Grandmaster Pedoy was born on October 16, 1900 in Ormoc City, Leyte, Philippines. At the age of six, he ran away from home and traveled into the mountains of the Southern Visayas where he was taken in by General Faustino Ablen. The General was a leader of the Independence movement against the occupying American forces on the island of Leyte. 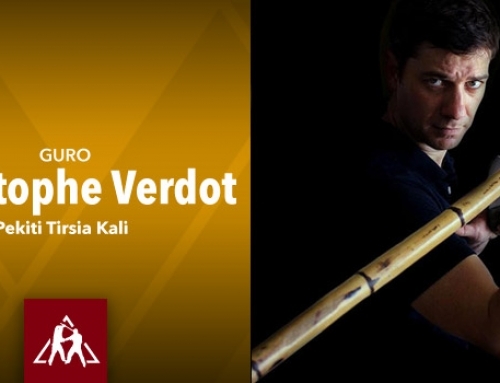 For eleven years, the Great Grandmaster lived and trained under the General in the art of Derobio Eskrima. At the age seventeen, Pedoy was tested by the General on what he had obtained in his years with him; their choice of weapon was the bolo. As it was told , the test lasted almost two hours with Pedoy receiving a cut on the chin and near the eye; the General none. Through his ability to survive the battle, the General awarded Pedoy mastership of his art of Derobio and the task to expand his knowledge of the martial arts and travel the land learning other styles of Eskrima. In 1924, his travels brought the Great Grandmaster to the island of Hawaii where he worked on the Ola’a Plantation. During World War II he worked as a security guard for the Army. Later in life he worked and retired from Gaspro Inc. 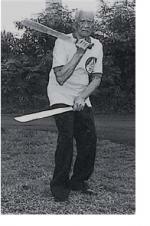 In 1961, Great Grandmaster Pedoy began the first Eskrima School in the islands. 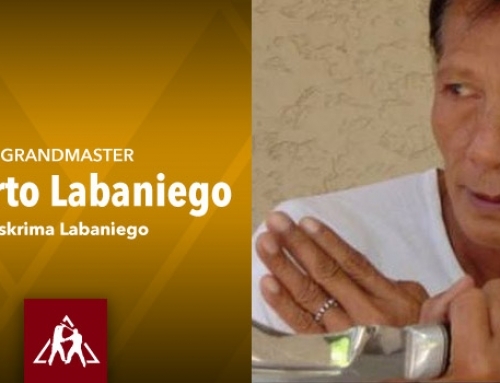 The Great Grandmaster would come to be known for his prowess as a man of counters and as a healer in the art of Hilot; Filipino healing and bone setting. 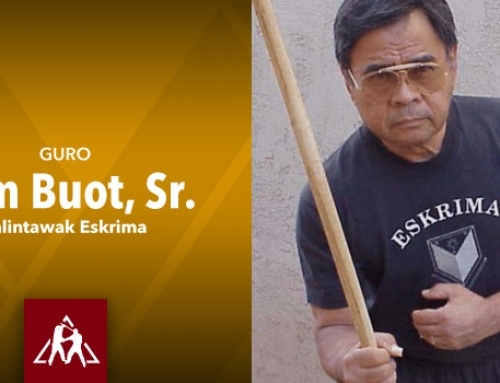 On April 9, 1976, he was awarded a Certificate of Recognition from the State of Hawaii, House of Representatives; awarded the entitlement “Eskrima Expert Extraordinaire”, House Resolution No. 633. 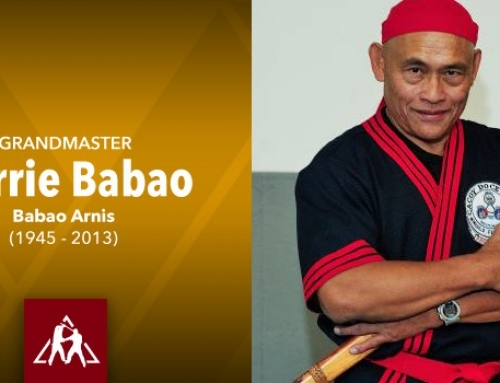 In 1991, he was inducted into the International Martial Arts Hall of Fame for his outstanding contribution in promoting the Philippine martial art of Eskrima. SIANGCO COLLECTIVE: The Siangco Ohana (family), true proponents of the martial arts, a culmination of decades of training and instruction. 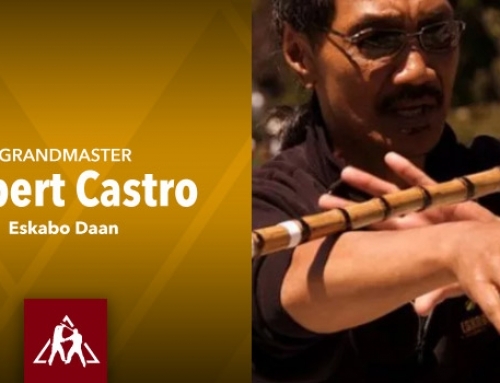 The Mentor – Grand Tuhon (6th Level Pulahan) Chris Siangco…the catalyst that exposed the warrior arts to his sons and guiding force of the foundation of Pulahan-Derobio Eskrima. 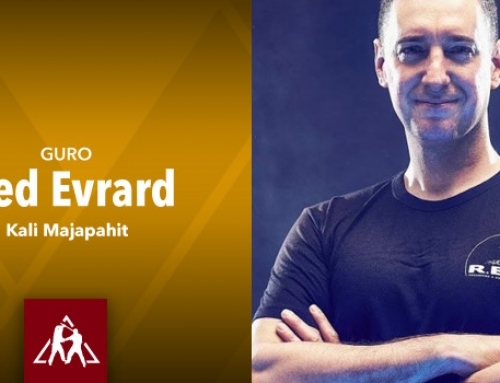 -Former Master Chief – 6th Level Chief Instructor of the Pedoy’s School of Derobio Eskrima. -Professor – 9th Dan Red Belt/ Silver trim under Grandmaster Julian “Blue” Generalao’s Chinese Kenpo. 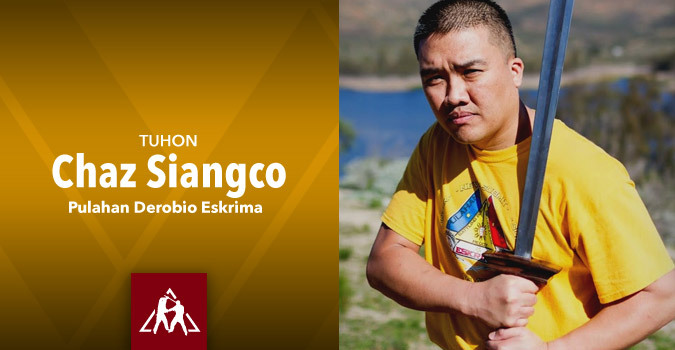 Born and raised in Hawaii and a lifetime of martial arts experience, Grand Tuhon (6th Level Pulahan) Chris Siangco’s martial art influences came from the ones he loved most. As a child, he trained in the art of Panantukan (Filipino boxing) under his Grandfather, Elias “Battling Bolo” Cantere, who was Hawaii’s welter-weight champ in the 30’s a major player in the Filipino Smokers fight clubs. 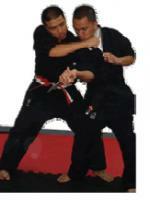 Growing up he also trained under his brother in the art of Cha 3-Hawaiian Kenpo. He later began training under Great Grandmaster Braulio Tomada Pedoy, who is the grandfather of his loving wife Gail, since the 1960’s. He also holds the rank of Professor (9th Dan – Red Belt w/ Silver trim) under Grandmaster Julian “Blue” Generalao, a long time friend and mentor. Grand Tuhon Chris moved out of the Valley Isle of Maui with his ohana to the mainland in the early 90’s with hopes of a new beginning. In 1992, their maternal grandfather, Great Grandmaster Braulio Tomada Pedoy passed away. 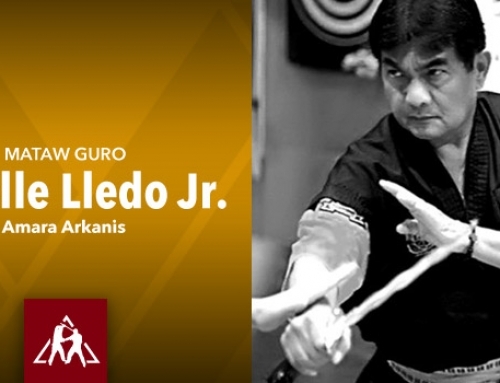 This was the catalyst that urged Grand Tuhon Chris Siangco and family to fulfill the Great Grandmaster’s dream of spreading his art of Derobio Eskrima. With the blessing of Batikan Eduardo Pedoy the dream took form. In any endeavor that one heads into, you must take time in finding the right path you want to venture on. Grand Tuhon Siangco decided to step off in the old school direction, teaching small private classes out of his home. He wanted to build a strong unit of head students and instructors before heading into the commercial market. For several years he taught in this manner, like the days when he trained in the banana patch and when Great Grandmaster Pedoy used to train his sons behind their home in Waiawa, HI. 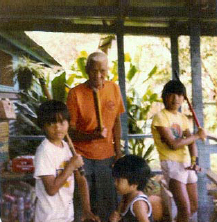 The Siangco ohana were brought up training in this private manner with the masters. As the years went on, they have seen enthusiasts come and go; nevertheless, they have groomed dedicated Derobio Eskrimadors which they now call family. In 1996, Grand Tuhon Siangco and the family ventured in the commercial market basing a storefront school in Chula Vista, CA. For several years they kept this venue open; however, Grand Tuhon always preferred the private setting of instruction. 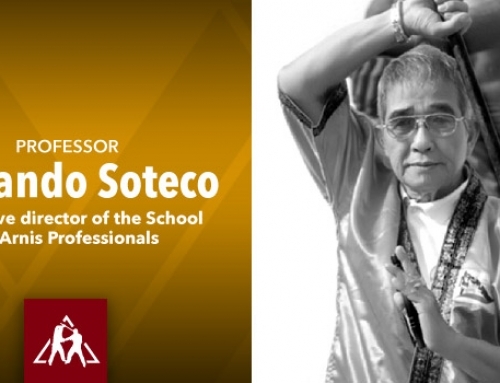 In 2000, the leadership and control was passed down to Tuhon Chaz Siangco where a new progressive vision of Derobio has been formulated and new instructors made through their lineage. Grand Tuhon currently teaches privately to advance students and instructors out of his home in Menifee, CA. 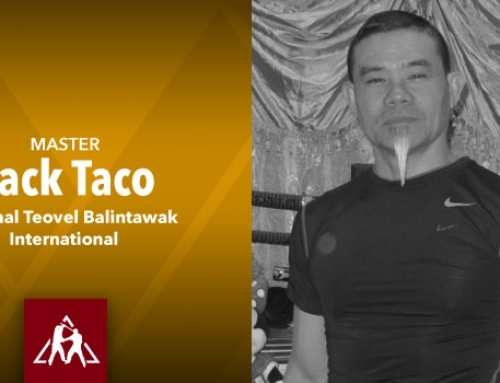 The Beacon – Tuhon (5th Level Pulahan) Chaz Siangco…the guiding light in the foundation and creation of Pulahan-Derobio Eskrima. 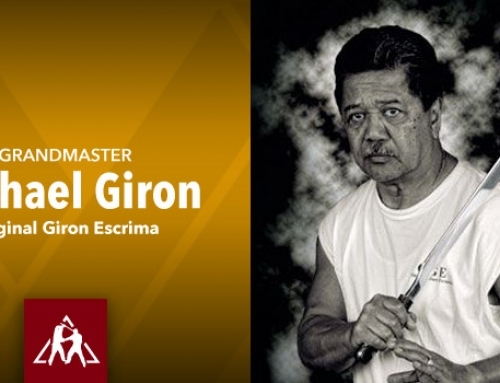 -Former Regional High Chief – 5th Level Chief Instructor of the Pedoy’s School of Derobio Eskrima. Born and raised in Hawaii, Tuhon (5th Level Pulahan) Chaz Siangco and his brothers were nurtured into the legacy of Derobio Eskrima. 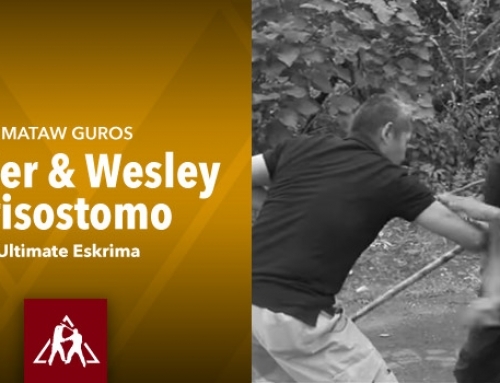 Training as soon as they could walk and pick up a garrote, the Siangco brothers began their journey at the hands of their great grandfather; the late Great Grandmaster Braulio Tomada Pedoy, Batikan Eduardo Pedoy and their father; Grand Tuhon Chris Siangco. Training one on one in the old ways as it was done hundreds of years before them and compiling over 27 years of training and instruction. 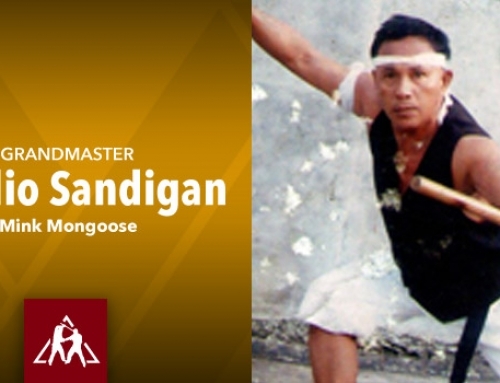 At the request and encouragement of his father, Tuhon Chaz Siangco studied various martial arts throughout his childhood and teen years to broaden both his physical and spiritual mindset within the martial arts. 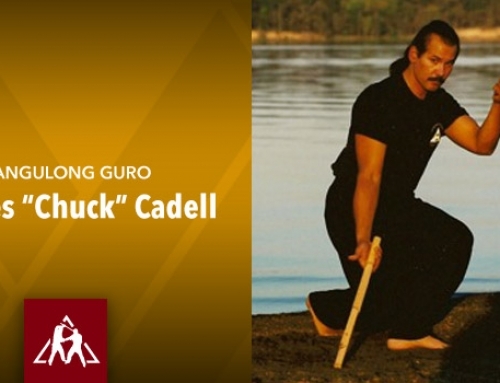 Kajukenbo, Chinese Kenpo, Tae Kwon Do, along with boxing and wrestling were disciplines that Tuhon Chaz studied over his life time, blending them with his family’s art of Derobio Eskrima. As an adult, he made it his life’s calling to seek out true masters of the arts and promote a brotherhood of FMA masters. 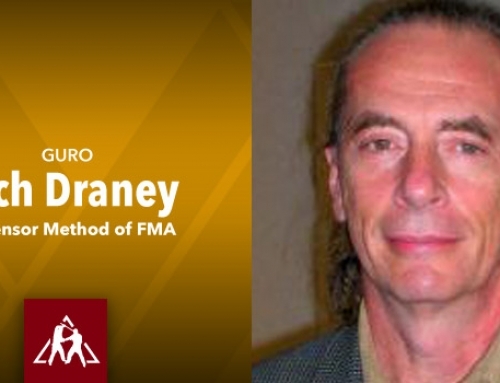 His path has created many friendships and mentorship’s with many great FMA practitioners. With the virtues taught to him through the Derobio Creed, Tuhon Chaz has achieved his Bachelors of Science Degree in Criminal Justice Administration and currently working on his Masters in Forensic Science. 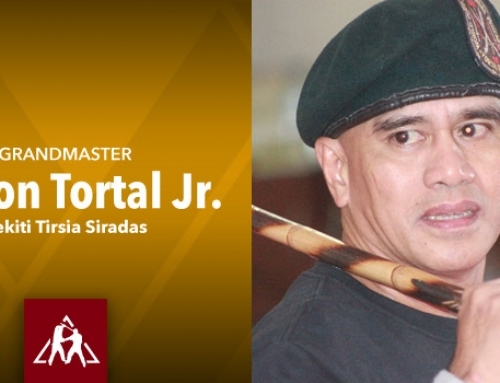 Now, one of the highest ranked practitioners of the Derobio Style of Eskrima and an accomplished tournament competitor, Tuhon Chaz is leading his family’s art into a new era along with his brothers. 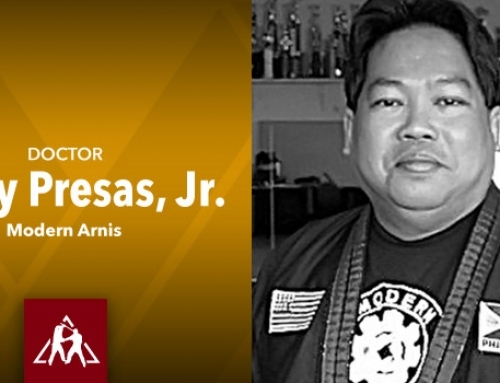 He has had the privilege to teach and train various accomplished Black Belts, Filipino martial arts practitioners, professionals, DEA agents, Border Patrol, police and military personnel. By teaching, he will be able to find his path and learn more of his art through his students. Tuhon Chaz also holds the rank of SiGung (6th Dan – Red/White Belt) under his mentor and teacher Grandmaster Julian “Blue” Generalao’s Chinese Kenpo. Currently, Tuhon Chaz has partnerd with Roger Gehring, a 20 year combat veteran with the U.S. Navy SEAL’s, in developing a tactical combat system founded on the principles of Derobio in conjunction with other influences both Chaz and Roger have incorporated in their fighting styles. Go to www.gktactical.com for more info. 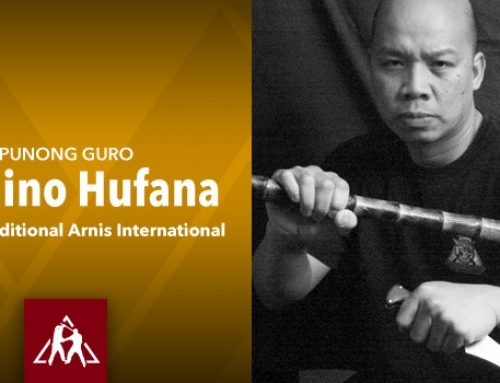 The Compass – Tuhon (5th Level Pulahan) Christian Siangco…a true man of God and one who leads Pulahan-Derobio Eskrima on a righteous path. 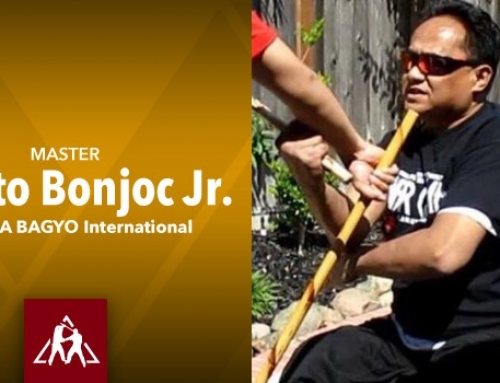 Tuhon Christian “Bo” Siangco “started training at the ripe old age of 5 under the watchful eye of Great Grandmaster Braulio Tomada Pedoy and now spanning over 3 decades of training and instruction. After Great Grandmaster Pedoy passed away he continued his training under Batikan Eduardo Pedoy and his father Grand Tuhon Chris Siangco who promoted him to his current rank Tuhon (5th Level Pulahan). Tuhon Christian “Bo” Siangco is currently serving as a newly promoted Chief Petty Officer in the US Navy where he has been for the last 18 years. Though away from home he never misses an opportunity to train and spread the message of Derobio wherever he goes. His vision is to see Derobio become what Great Grandmaster wanted, something for all to benefit from. He trains by this motto “In order to be great you must be willing to pay the price in blood and sweat”. Tuhon “Bo” also holds the rank of SiGung (6th Dan – Red/White Belt) under his mentor and teacher Grandmaster Julian “Blue” Generalao’s Chinese Kenpo.